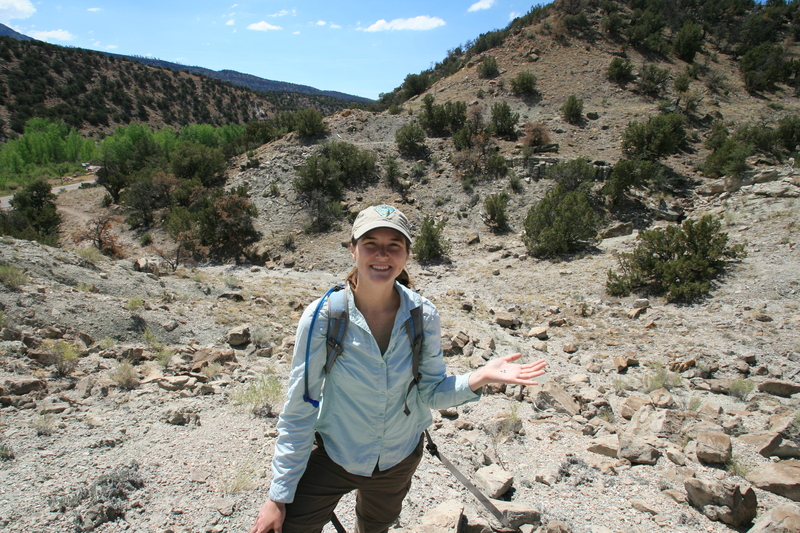 Author working in the Garden Park Fossil Area north of Cañon City, CO as a GeoCorps participant last summer. After a meeting in Denver last June, Bureau of Land Management (BLM) GIS Specialist and my mentor, Ben Zank, and I drove back to Cañon City, Colorado (home of the Royal Gorge and the BLM’s Royal Gorge Field Office). That happened to be the day the Black Forest fire north of Colorado Springs started. This fire destroyed 509 homes, making it the most destructive fire in Colorado history. The huge smoke plume was incredibly dense and close to us as we passed it on the highway. As we neared Cañon City, another smoke plume was becoming larger, and from our viewpoint, was directly above town. The Royal Gorge Fire started the same day about 8 miles west of Cañon City, and had amazingly jumped the Arkansas River near the Royal Gorge Bridge. Ben knew he needed to get to the office as soon as possible. He responds to wildland fires as a GIS Specialist, a job on emergency response teams I never knew about until starting my GeoCorps project with the BLM. He dropped everything he was doing for the next week to produce maps used for incident planning almost around the clock. The field office I worked in turned into the incident command post, and suddenly everyone had a new job to do. Within the office, new workstations were set up for the command and GIS staff, supplies were gathered and transported to the fire crew, and public meetings were planned, all in the blink of an eye. 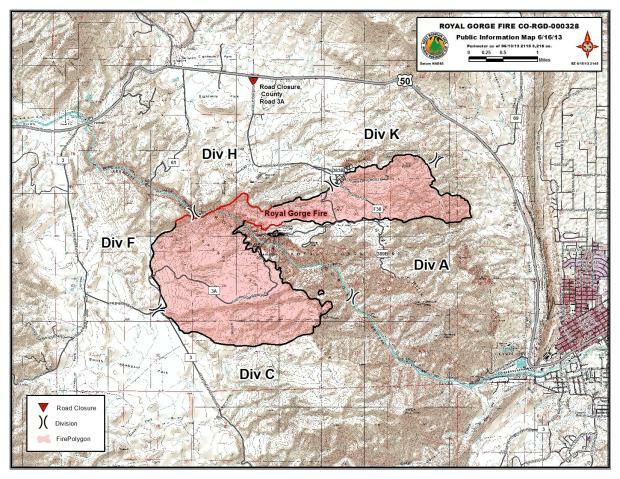 A public information map created by a GIS Specialist for the Royal Gorge Fire. This map came from InciWeb (inciweb.nwcg.gov). From the long hours the BLM staff spent at the office during that time, it was obvious that their concentration was on supporting each other and the fire crew through the grueling workload. Teamwork in the BLM was a main theme even for the normal business I was a part of at the Royal Gorge Field Office (RGFO). For the field office to run smoothly and work through complex issues, everyone relied on each other’s expertise and worked together to fulfill the “multiple use” mission that the BLM follows. Budget cuts last year created unprecedented worry for everyone – what programs would suffer, will empty positions ever be filled? Taking on interns takes a lot of work, but everyone in the office was supportive of my position, especially my mentors. GeoCorps volunteers had worked at RGFO for a few years before me. Paleontologists had developed monitoring and educational materials for the Garden Park Fossil Area, and mining geologists had assisted with regulating popular gold prospecting hotspots along the Arkansas River. I was extremely lucky to have been a part of the geology, paleontology, and GIS worlds of BLM Colorado. I learned a lot of great skills that have already rewarded me professionally and personally, but the satisfaction of knowing my work directly helped the BLM staff who worked to keep me there throughout a tough year was my favorite part of the whole experience. My Geological Society of America’s GeoCorps America project was the perfect opportunity, in timing, location, and position, for me to experience working for the Federal Government. After defending a master’s degree in Earth and Planetary Sciences at the University of New Mexico, I moved to Cañon City to work on a GIS and Abandoned Mine Lands (AML) GeoCorps project at RGFO. My two mentors, a geologist and a GIS specialist, tasked me with cleaning up Abandoned Mine Lands data, at first. By the end of my first 3 months, they each had whole, new agendas for me. I ended up working on many GIS and computer programming projects for the entire office and eventually for the whole state, as well as on AML cleanups, and paleontology and geology education for the local community over the next year. For a part of the year, I was the AML/Paleontology/and GIS volunteer all at the same time. This happened naturally as I took on more responsibility, and I think it gave me a great idea of what a full-time job with the BLM would be like. Detailing the month of June in particular will help to describe my experience. June was fun. The first week was the annual Fremont Teaching Environmental Science Naturally (TEN) teacher workshop. Teachers from schools around the county get field based training on environmental topics. The 2013 theme was “From Mountaintops to Toilets” – where does your water come from and what does it do. Every year, Melissa Smeins, the BLM geologist I volunteered with, presents on the local geology, but she asked me to give presentations on river hydrology and geothermal energy – at a nearby hot springs (This was my job!). The same week, Melissa and I made a trip to verify the locations of abandoned prospect pits outside of Boulder, CO, with a Colorado Division of Reclamation and Mining Safety (DRMS) geologist. We collected GPS data to compare to surface land status maps and assessed physical safety hazards. CO DRMS leads remediation efforts for physical and environmental hazards associated with mining in Colorado. Throughout the year, I was introduced to how the BLM partners with state and other federal agencies, and private groups to get things done. Throughout the month, a Southwest Conservation Corps (SCC) volunteer and I were coordinating days when we could both head out to the historic dinosaur quarries of Garden Park Fossil Area just north of Cañon City. We inaugurated the monitoring plan created by the past summer’s brilliant GeoCorps and SCC volunteers. Sometime in that month, I had the opportunity to complete a Mine Safety and Health Administration (MSHA) 2 day training that did a really good job of scaring me away from active mining operations. Many BLM geologists primarily deal with the permitting and inspecting of mines on public lands, so this was very valuable training. Finally, a project was idealized this month, and presented to me as a way of eventually extending my GeoCorps term through another BLM program, Oil and Gas. The work I did for Oil and Gas was exclusively GIS and computer programming and took its own 3 months to complete. 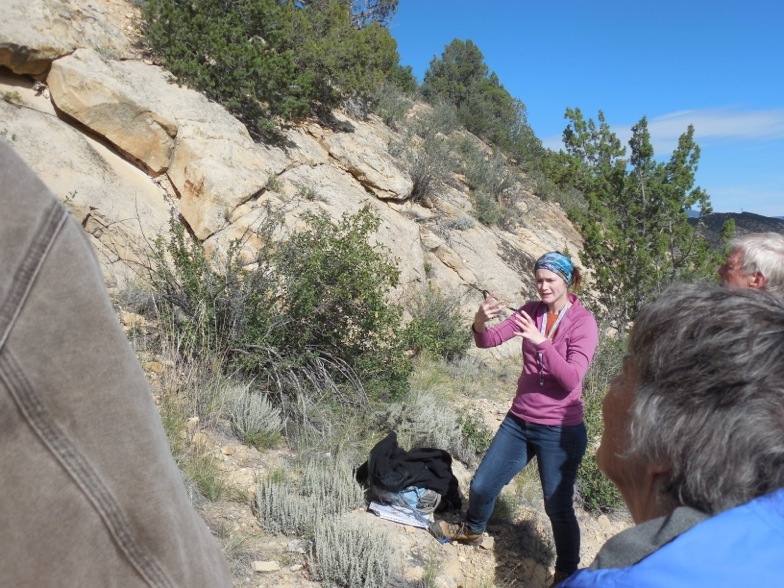 Another important task I had this month was serving as an assistant tour guide of Cañon City’s geology for the Geological Society of America’s Rocky Mountain Field Camp for Teachers that cruised through town one day. It was a great month. RGFO is in a small city in south-central Colorado. Cañon City is surrounded by amazing geology and history. Cripple Creek and Victor are nearby, historic mining towns where there is still an operating gold mine (the most productive in Colorado). They are accessed either by the Shelf Road – which travels past Garden Park and exposes rocks that hold some of the oldest vertebrate fossils in Colorado (the Ordovician Harding Sandstone) – or the Phantom Canyon Road – which once connected Cripple Creek to Florence, CO by railroad. Florence is next to Cañon City and was the center for coal mining in the area during the Gold Rush of the late 1800’s. Oil production put Florence on the map. In fact, the first oil well west of the Mississippi River was drilled near Cañon City in 1863. The geology of the area showcases everything from Precambrian intrusives and Ancestral Rocky Mountain debris to the rocks of the Cretaceous Interior Seaway. Geology excursion to Shelf Road, north of Cañon City. This stop was to check out the Harding Formation. The amazing, local geology is not lost on the community. The Garden Park Paleontology Society has been protecting and interpreting the history and paleontology of the Garden Park Fossil Area for the region since the 1990’s. The Cañon City Geology Club can claim establishment as the first geology club west of the Mississippi River. The geology club works closely with a new group of geology education enthusiasts, the Fremont County Stones N Bones. Some of my best memories from Cañon City are from going on hikes and giving presentations with the Stones N Bones. Melissa asked me to help out a group of volunteers who wanted to bring geology to the people of Cañon City. We had meetings, went on field trips, and came up with educational material for kids and adults. In fact, the Fremont Stones N Bones put on dozens of events while I was there. They put on a geology-extravaganza during the month of October, in honor of Earth Science Week (we had too much to do for a single week). We also went to local schools and libraries to give presentations with lots of hands on materials. Cindy, Dan, Mary, Millie, and all the other Stoners (their term) are all ‘mature’, but they have as much energy for geology hikes as geology students on the first day of field camp (actually, they all would really like to go on field camp). Officially, I helped produce some educational geologic maps and plan a budget, but unofficially I went on all the field trips and stepped in with random bits of geology. The pointless furlough put a wrench in my projects during October and ruined the National Natural Landmark dedication ceremony Melissa had planned for National Fossil Day at Garden Park. It could not, however, slow down the Stones N Bones calendar, since most of their events were led by local geology enthusiasts and historians. 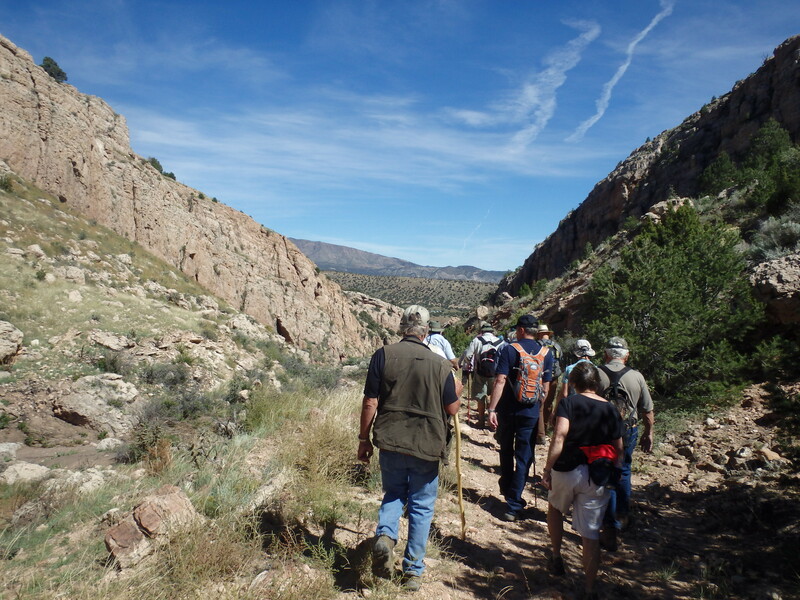 An Earth Science Week hike along the old Priest Canyon Road from the Precambrian rocks of the Royal Gorge to the Cretaceous rocks around Cañon City. Every hike, jeep tour, and talk was incredible, and after so many years of stress and schoolwork, this group reminded me that geology should be fun. Because of them, I really wanted to work hard to share what I loved about geology with others. Certain members of this group, ahem, wrangled me into the Cañon City Geology Club, where local geology was further explored and enjoyed. It is hard not to be amazed at all the different divisions of geology that are expressed around Cañon City. I was so impressed by nearby Pleistocene/Holocene fluvial terraces, I ended up writing an article for the local newspaper (which led to a few more articles). The ending of my position hasn’t ended the geologic fun to be had in Fremont County, CO. The Geology Club and Stones N Bones are really looking forward to getting more BLM GeoCorps volunteers to bring them geology enthusiasm! One of the hikes led us down the Dakota Hogback into the Cretaceous shales and limestones underlying Cañon City. I probably stopped everyone to talk about ripples on bedding surfaces of the Dakota Sandstone. (Photo Courtesy of Cindy Smith). Thalassinoides or Orphiomorpha? Stones N Bones member Cindy Smith and I are pointing burrows out on one of our hikes (Photo Courtesy of Cindy Smith). What helped me contribute to each BLM program I worked for was my experience working with spatial data. Ben and Melissa made my GeoCorps projects dynamic enough where I could make them my own. They had support from their supervisors and other BLM staff to introduce me to as much of the BLM as they could. The project that helped convince them to keep me around was one I completed at the request of a Realty Specialist at RGFO. Steve, was tired of inaccurate and incorrectly formatted legal land descriptions based on the Public Land Survey System (PLSS). So, he asked Ben, who asked me, to figure out a way to help people create legal descriptions more efficiently. I ended up scripting a tool that BLM employees across the state use within ArcGIS to create PLSS information from their spatial data. I never knew that I enjoyed computer programming until working on that project. It led to the creation of many more Python tools while I was there. Certain parts of the scripting did drive me crazy, but once it worked and people started using it, it was a great feeling. Natalie, a GIS specialist at the BLM CO State Office and Ben saw an application of my new PLSS tool to a project that was being developed by the State Office’s Oil and Gas team. My last months as a GeoCorps volunteer were mostly spent developing a tool to help create and populate a database of Oil and Gas Stipulations for public lands in the state of Colorado. 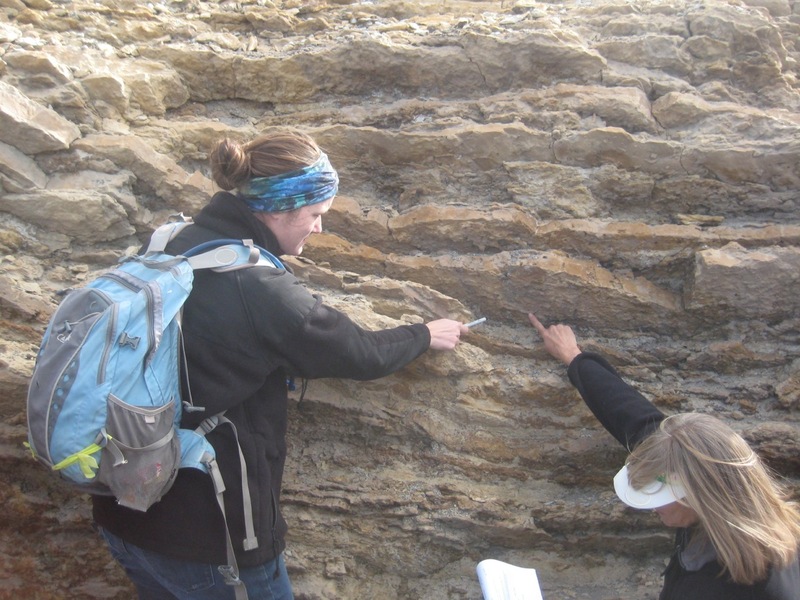 Geoscientists fit into many different positions in federal land management agencies. Federal minerals and fossils are best understood and protected by trained geologists and paleontologists. Geophysical surveys help geologists to understand complex subsurface heterogeneity associated with abandoned mines and their tailings piles. Riparian geomorphology and hydrology are major focuses for land managers. Many federal, GIS Specialists have science backgrounds. Based on my school experience, I think most recent geosciences students have some GIS training. My familiarity with GIS and remote sensing from undergraduate and graduate schools is what got me this particular GeoCorps opportunity. Conducting independent research in graduate school definitely helped me work independently and efficiently. A literature review in academia – in government, would be policy and case study reviews. Research methods should be well documented and reproducible – the government lives by Standard Operating Procedures and producing metadata for your work is highly encouraged (especially true for us transient volunteers). Also, it is up to the researcher to be self motivated, which is something all employers want in their employees. Posting an abandoned mine closure notice in April outside of Buena Vista, CO.
Volunteering for the BLM felt very symbiotic. I learned things that have already benefitted me professionally, and provided products that would not have been completed otherwise. The mentors I had were not shy about expressing this to me. GeoCorps participants are being recognized for their contributions to public land conservation and are making up the new generation of federal geoscientists, i.e. taking over the world. 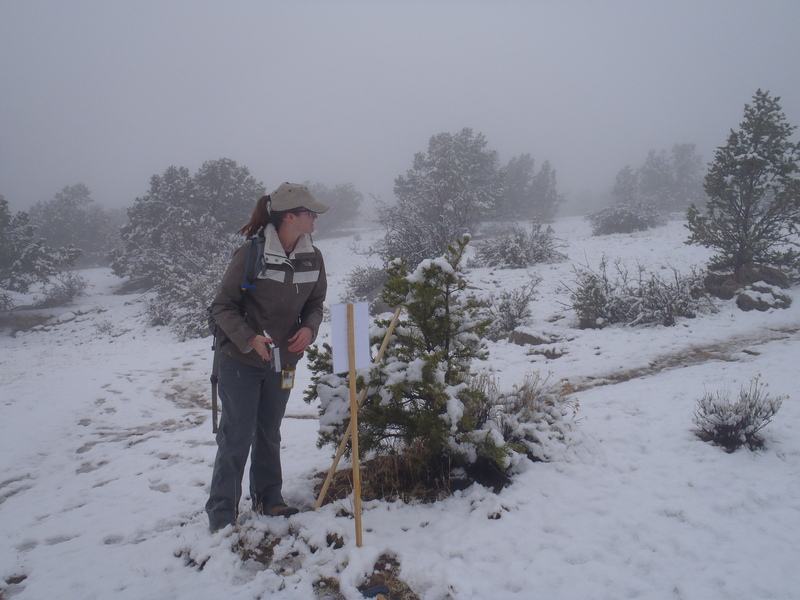 Through the AML program, I got to know Jason Frels, a past GeoCorps volunteer who started off in Washington D.C., explored Alaska, and eventually ended up in Denver with the BLM’s National Operations Center. Prior to me, a GeoCorps who volunteered with active mining operations in the Royal Gorge Field Office, Amy Titterington, started a full-time position with the BLM in Arizona. 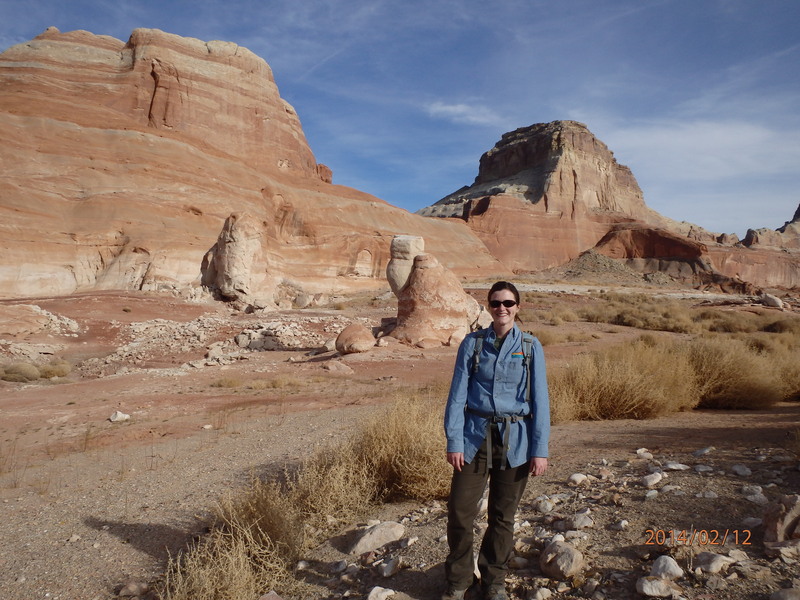 Another GeoCorps participant from RGFO who worked alongside me, Carissa Shilling, just started a full-time position in Nevada with BLM. This year, I started a full-time position as a Physical Scientist at the Glen Canyon National Recreation Area. This position would not have been available to me without my GeoCorps experience in Cañon City. My work with the National Park Service will provide new experiences and skills that will prepare me for even more adventures in the future. I am also excited about working as a GIS Specialist Trainee this summer on a wildland fire response team. I do not think GeoCorps is only a good opportunity for people interested in government employment. Understanding how land management agencies function would help new geoscientists in industry, as well as anyone conducting research on public lands. I was exposed to a wide-variety of geoscience careers within the government, state agencies, and private contracting groups. The BLM relies on partnerships to close abandoned mines, excavate paleontology resources, and monitor water quality on public lands. Every GeoCorps experience is different, as I learned through meeting other GeoCorps volunteers: Lisa Luna managed water quality data for the Lake Fork Watershed Working Group while working with the Colorado Mountain College and the BLM; through field excursions, I met a whole troop of brainy, GeoCorps and Mosaics in Science paleontologists working at Florissant Fossil Beds National Monument. The work I did and people I met in Cañon City and throughout BLM CO changed my outlook on my forever-developing career as a geoscientist. I am extremely grateful to the GSA for developing the GeoCorps program, and to the BLM for seeing its value. Author in front of Gunsight Butte in the Glen Canyon National Recreation Area. To DR.Khandakar On the picture above the geologist visited many places specially around canon city where the found many interesting rocks that were millions years old.